Participants report back on their experiences! What are our trainees saying about the Vertical Rescue College training programmes? "Durch den Kurs wurde sehr wertvolles Wissen für die Sicherheit im Gebiet Absturzsicherung vermittelt." "Ich empfang die Schulung vor allem sehr nützlich, da wir die im täglich Umgang bzw. bei den regelmäßigen Revisionen auftretenden Fragen theoretisch und praktisch detailiert besprochen haben." "Zu loben ist die sehr gute Organisation und Vorbereitung dieser Weiterbildung und die wirklich freundliche Betreuung." "For several years, I have regularly participated in Skylotec training courses, which greatly strengthen my safety skills and improve my abilities for work on onshore / offshore wind farms. The trainings serve as excellent refreshers. The courses demand and offer the possibility of active participation." "The training was good overall. The coaches had a lot of expertise, both in theory and practice. Classrooms and catering were good. [...] Unfortunately, no steel lattice mast exists with real rise ratios, because 3 participants working in the energy supply to overhead lines." "The theoretical and practical skills have been imparted and trained very well. The trainer answered to all my points and questions in a detailed matter. All in all a very successful and instructive week." „Very good and extensive training. Especially practice-oriented, due to the different services and mounting situations. Instructors are always in a good mood, provide a good atmosphere and involve their experiences and practical skills. I would be happy to come back." „More than competent explanations and presentations. Everything was perfekt." "This was a very well organised course from beginning to end. The trainer was very skilled and the training hall was very well-equipped. I can fully recommend this course to others." "Training level was very high, super motivated group and trainers. We had an intense week of fun and rope access training in a well-equipped training ground." "As a new person in the trade I have to say that the explanation of all theory and practical was very clear and useful." "Mr Heumann delivered this training course very methodically and his teaching methods were very interesting. The contents requested by the customer were delivered in a theoretical and a practical section. This meant that the participants could apply what they had learned to their working processes. The exercises are very supportive. Thank you very much for a very nice training session." "Very well-structured course. From the theory section to the very informative practical course, this was once again a great training course with a very pleasant atmosphere. :-)"
"Very experienced training, practical exercises, which were repeated if necessary. Super! Highly recommended." "The training was very useful. The instructor was highly competent! The selection of climbing towers had deteriorated drastically since 2004. Only one standard steel tower is used now. It's a shame and it implies a certain "saturation level" with regard to customer care. If there had been 2-3 steel towers, I would have given you a score of 1 but as it is, I'm only giving a 2-3." "The training was very useful and enjoyable. The theory and practical sections were well-structured. The facilities and service are good. The instructors had a good level of background knowledge. The atmosphere was pleasant and we had some lively discussions." "I found the training very useful indeed. The instructor has a very good level of practical knowledge, which was evident during the training course. The course ran smoothly and in a logical sequence. At this price, I would definitely recommend this seminar. There was also plenty of time for discussions with other participants"
"Very practical training. Great examples. Nice atmosphere." "Nice atmosphere, good mix of participants, good contents and material, which was communicated in a way that was easy to understand." "The course really appealed to me. A modern training centre with a high level of technical expertise. The course content prepares you very well for the written and practical tests. 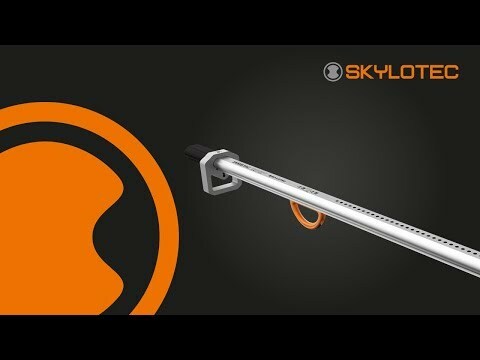 I would definitely recommend Skylotec as a company." "Very skilled transfer of knowledge, good comparison between Milan 2001 and Milan 2.0. Possible to get direct explanations in answer to detailed questions. Being able to use the device myself was also important, as was evaluating the function check and maintenance." "This training course totally fulfilled my expectations. There was a good balance between theory and practical exercises. The instructor put together a very relevant and skilled training course. The training facilities and climbing hall are very well equipped." "Instructor: competent, experienced; Transfer of knowledge: highly successful; Usefulness: used a lot; Price: OK - average; Theory / practical: good balance, lots of exercises." "Very comprehensible and extensive training course, which dealt with the questions and issues faced by the participants. Situations are explained and illustrated using sample cases. Possibility of trying things out and getting practical tips."